Back from a wonderful spring break, we began our study of mammals. We talked about what makes an animal a mammal and drew some of our favorite mammals. We sorted animals by groups (land animal vs aquatic animal, diurnal animal vs nocturnal animal vs crepuscular animal, mammal vs bird vs reptile vs etc.). We built several Marble Mountains. Then we did a bit of carpentry, nailing boards to wooden stakes to create signs for the trailheads around the school campus. We used rubber mallets to install our signs by several trails. Be sure to walk the trails and let us know how you like the new signs! We hiked a circuitous route through the wetlands, along Little Noonday Creek, and back to Kindy Beach where we swam, played on the banana slide, and ate our lunches in the sun. We had our last Creature Feature of the school year. Cobb County Officer Elijah Barnett brought his bomb dog, a dark German Shepard named Norbo. Both the dog and his handler were awesome and the students enjoyed petting Norbo and asking questions about their work. We held the school's new baby chicks, eight in all. We played animal beanbag toss (not with the baby chicks!). To burn off some energy, we ran around the pond, in both directions! We continue to practice our Maypole Dance with the other grades students and under the excellent direction of Ki Kathee. The students will be preforming this dance at 11:15am on Friday, May 3rd. This is optional for HomeSchool since we don't meet on Fridays but come if you can. It is a lovely ceremony. More info will be coming about what they should wear. The Springtide Festival was a great success and a lot of fun! In my area, kids built over 35 fairy houses to take home with them. Thanks to all of you who came out to play and to help with the setup, cleanup, etc. It has been difficult to plan around the weather this spring! Tuesday looks like it will be drier than Thursday so we will do Storm Drain Marking, Part II on Tuesday. Students should wear tennis shoes, not rubber boots. We'll meet at the same location as before at 9:00am Tuesday so drive straight there rather than dropping off at the school. To get there, take a right out of the church/school and head north on Canton Road. Take the first right onto Ebenezer Road. Cross the railroad tracks. Take the next right onto Bellair Drive. Turn left onto Debonair Drive. We will meet in that culdysac. We will be marking storm drains from 9:00am to 11:00am. We ask that parents stay for that time. If you have a conflict that day, you may arrange with another HomeSchool parent to transport your child both ways. We will arrive back to the school by 11:30am, in time to write and draw our thank you cards to Officer Elijah. On Tuesday, the older Girl Scouts (Elsu, Ellie, Nola, and Alys) have a planning meeting in the Blue Sky Room at 3:20pm to work on their Silver/Bronze Award project. 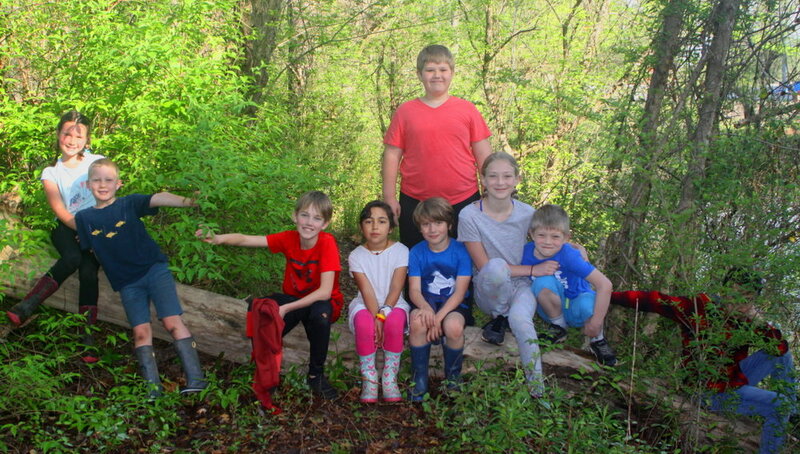 For Thursday, please make sure your child brings these things for our hike and swim in the creek: rubber boots, water shoes, swimsuit, shorts, t-shirt, a change of clothes, tennis shoes, three pairs of socks, and a dry bag for wet clothes. Looking ahead, I will send out all the details next weekend about our HomeSchool field trip on Thursday, May 2nd. We will meet at TELLUS Science Museum in Cartersville at 9:45am that morning. All parents and siblings are welcome to join us! We'll eat a picnic lunch and tour the Booth Western Art Museum in downtown Cartersville in the afternoon. There is a cost for each museum. If you can't participate, you may make carpool arrangements with another HomeSchool family. Quote from a child: "During spring break we found shark's teeth on the beach. Some were white and some were black. I know why some were black. Because those sharks didn't brush their teeth!" 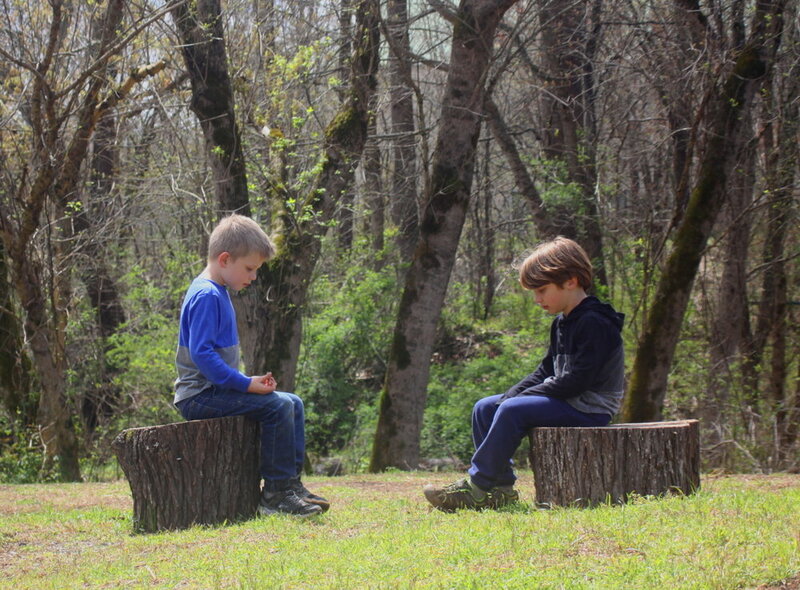 Quote from Jane Nelson: "Children will listen to you after they feel listened to." What a pretty week we had! On Tuesday we learned about the bp oil spill that occurred in April 2010 on the Gulf coast. We talked about how the spill affected so many birds, especially brown pelicans, seagulls, gannets, and ospreys. Please look up these bird species with your child so they can see what they look like! We did an activity where we found oiled pelican and seagull feathers and tried to clean them with Dawn dish detergent. 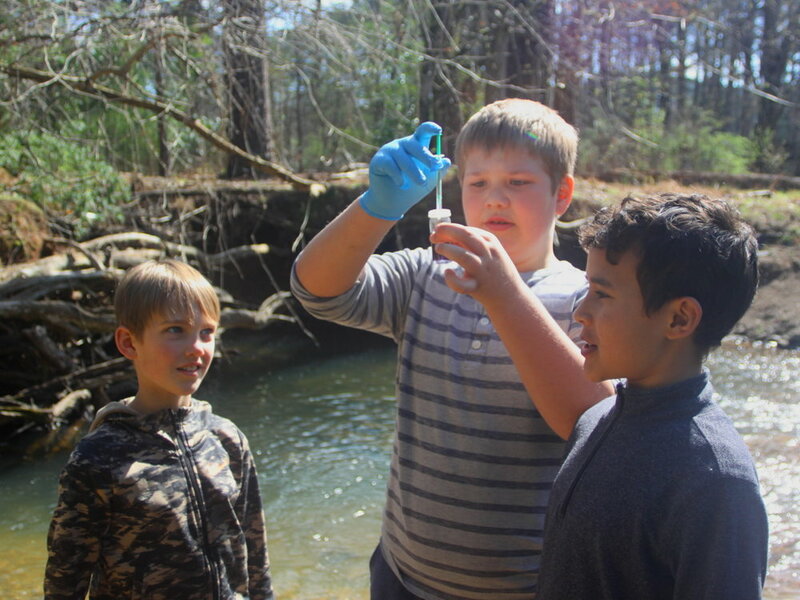 Also on Tuesday, Bear, Cooper, and Brolin helped me monitor the water quality on Little Noonday Creek. Our school has monitored the creek once a month since September and it is amazingly clean. It has an average pH of 7 (perfectly neutral) and an average oxygen level of 9 parts per thousand (very healthly). 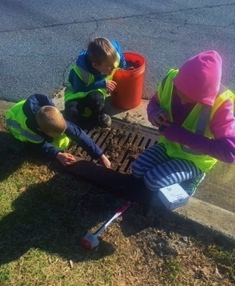 Thursday morning, we placed frog markers from Cobb County Watershed on the storm drains in a neighborhood behind the school. It’s a way of reminding residents that only rainwater should go down our storm drains. That means no leaves, grass clippings, trash, pet waste, cigarette butts, leftover grease, motor oil, rocks, or coals from the BBQ grill! A HUGE thank you to Ki Debbie and Ki Heather for adding the collector app to their phones and helping us cover three large sections of the subdivision. We cleaned, marked, and recorded 34 storm drains. In addition, we hung 82 bags of educational materials on the mailboxes of the homes along the way. All of these storm drains lead into the Little Noonday Creek watershed. 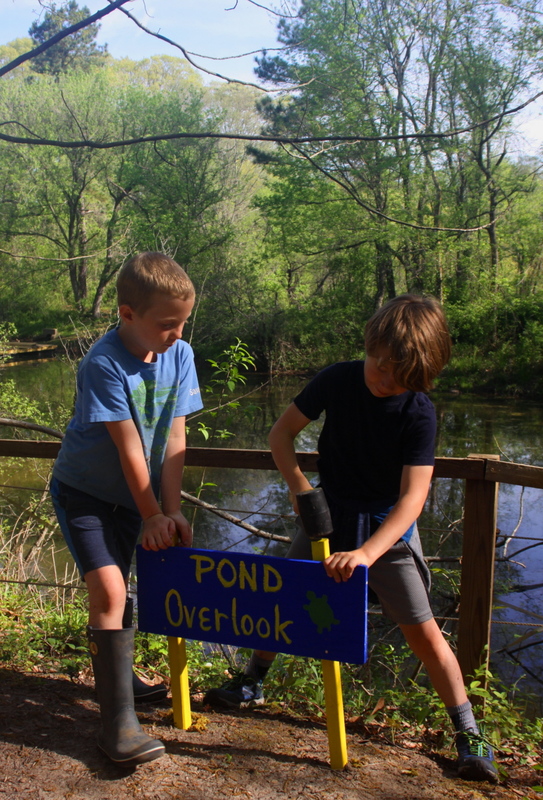 The HomeSchool students were VERY excited to do a project that helps protect Little Noonday. They would like to go back and mark storm drains along the roads that we missed. We could do more storm drain marking Thursday, April 18th, either 9:00 to 11:00am or 3:15 to 5:15pm. Which is better for each of you? I would need two parents to be with us again to serve as small group leaders so we can split into three groups. I hope you had a relaxing and adventurous spring break. I flew to Dallas to help my little sister Stacey. She had surgery on her foot and will be in a boot for 5 weeks. I am her nurse, chauffeur, and egg collector (she raises chickens) for the first week! This week, we will begin our study of mammals. We'll have our last Creature Feature on Thursday: a Cobb County bomb dog! Quote from a child: "I didn't stat crying because I knew I could do it. I'm a lot stronger than I look!" Quote from Stacia Tauscher: "We worry about what a child will become tomorrow, yet we forget that he is someone today." We had a wonderful morning at Gibbs Gardens in Ball Ground. It started off cold but warmed up quickly. There was lots of sunshine and so many daffodils! We hiked the trails and climbed on the mulch pile and rolled down the hill at the great lawn and explored the lily ponds and enjoyed the many sculptures throughout the gardens. Our favorite place to sit was definitely the swimming pool with its many waterfalls and flower beds. Thanks to all the parents who helped. It was delightful to have all the little brothers and sisters join us too! This Tuesday we will learn about the bp oil spill that occurred in the Gulf of Mexico in April 2010. We will try an activity that involves cleaning oil from feathers. We will do the monthly water quality monitoring on Little Noonday Creek. Garden Girls Girl Scouts will meet Tuesday at 3:30pm in the neighborhood behind the school for our storm drain marking community service project. To get there, turn right out of our driveway onto Canton Road heading north. Turn right onto Ebenezer Road. Turn right onto Hadley Farm Drive. Turn right into the first culdysac, Croy Court. We will divide into three small groups led by Ellie, Elsu, and Nola. I'll work with one group. Kenny will work with a group. And we need one more parent to help with the third group. You will need to install a locator app on your smart phone before we begin (you can remove it afterward). Parents need to bring their Girl Scout to this neighborhood and stay until we are finished or arrange for a ride with another Girl Scout parent. I'll send out a Girl Scout email with more details. On Thursday, HomeSchool students will mark the storm drains in the next neighborhood. We will meet at 9:00am. To get to this neighborhood, turn right out of the school/church driveway onto Canton Road. Turn right onto Ebenezer Road. Cross over the railroad tracks and turn right onto Bellair Drive. Turn left into the first culdysac, Debonair Drive and park there. You will need to drive your child there or arrange with another HomeSchool parent to transport your child. I will be able to take Elsu, Bear, and Mike in my car because it is such a short distance. Caitlyn: Debbie can transport Lucan if you will install his car seat in her car before you leave. You'll need to meet her at the school at 8:40am. I will need two HomeSchool parents to help me by installing the locator app on their smart phones and walking around a loop within the neighborhood with a group of 3 students, recording the storm drains. I will train the whole group before we begin! We'll return to the school in time for lunch and Creekcess. On Saturday, March 30th, people around the world will participate in the annual Earth Hour. It takes place from 8:30 to 9:30pm local time. During that hour, we ask that you turn off all lights in your home (including porch lights and other exterior lights if you can control them). You may use candlelight or flashlights. Also turn off or refrain from using as many other electrical appliances (stove, television, dryer, etc.) as possible during Earth Hour. The drop in energy use is significant, and you can see the earth darkening from space as Earth Hour moves around the globe. Quote from a child: "I didn't know there was such a thing as a waterfall and now it is my favorite thing in nature." Quote from Wilfred Peterson: "Walk with the dreamers, the believers, the courageous, the cheerful, the planners, the doers, the successful people with their heads in the clouds and their feet on the ground. Let their spirit ignite a fire within you to leave this world a better place than you found it." Signs of spring are everywhere and we are enjoying more outdoor time at The Garden School. 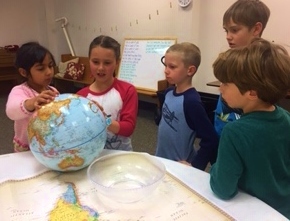 HomeSchool students gave their bird migration presentations and practiced tracing bird migration flyways on a world map and the class globe. Our champion migrator was Ollie's bird, the arctic tern, which travels up to 25,000 miles each year from its Arctic breeding grounds to Antarctica and back again. We drew birds using colored chalks. We learned how to use a compass, played compass basketball, and followed our compasses on a scavenger hunt through the forest. We took a close look at a goose egg and visited with a tiny turtle and an anole. We ate lunch on Kindy Beach and played in the creek, although the water is still a little cool. 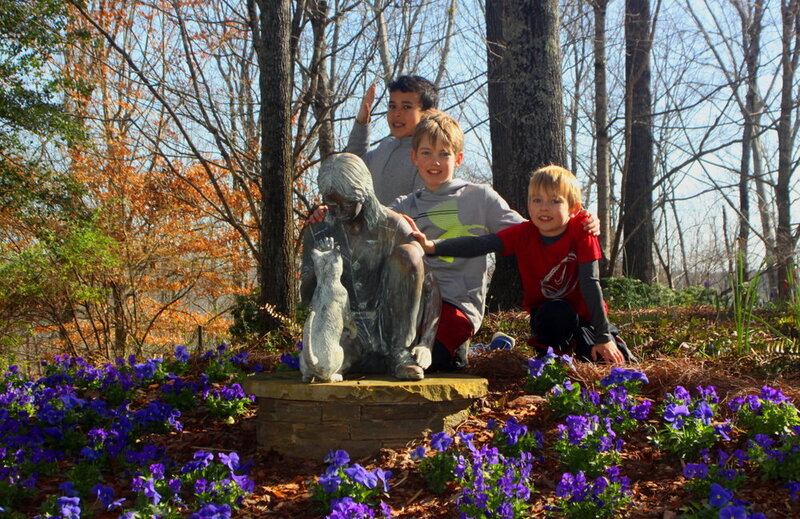 This Tuesday, March 19th, HomeSchool will meet at Gibbs Gardens for a field trip at 9:00am. Gibbs Gardens is located at 1987 Gibbs Drive in Ball Ground, 35 miles and 45 minutes north of The Garden School. 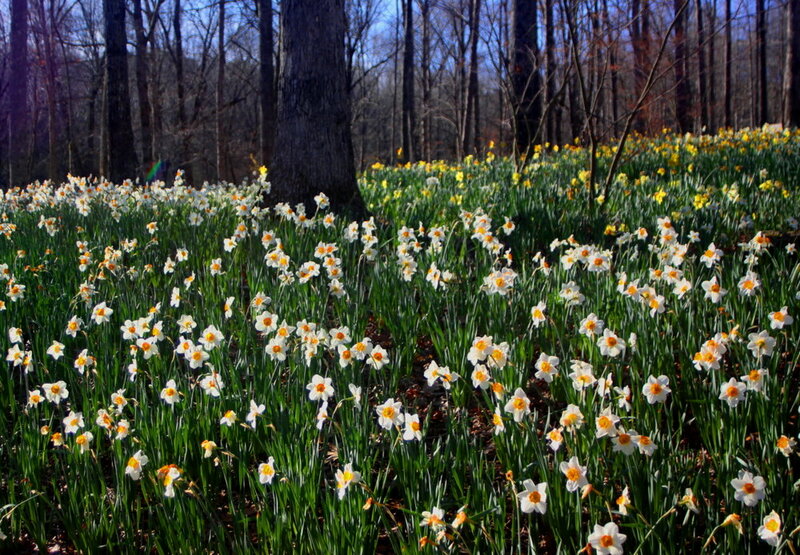 We will hike through the daffodils, 20 million daffodils in full bloom this time of the year, and tour the gardens. Gibbs has the largest display of daffodils in the nation. Parents should plan to come with us or arrange to have their child ride with another parent. Cost is $20.00 for adults and $10.00 for children. Siblings are welcome to join us. No pets are allowed. No food or drinks are allowed except for water bottles. They have an Arbor Cafe in the gardens, and restrooms in two locations. Please be on time. There may be a line of cars at the entrance when you arrive. Go through the entrance and meet me in the parking lot. Text me when you arrive. We will be at the gardens from 9:00 to 12:00pm. We will not eat lunch as a group. I'll return to the school so I can help with afternoon programs there. I'm not able to transport students in my car that distance. You are welcome to stay at the gardens longer or to head home instead of returning to the school. On Thursday, March 28th, we'll have our second field trip...to the neighborhood behind the school. That's right. We are going to place Watershed Stewardship frog markers on each of the storm drains in the neighborhood, and hang bags of educational materials on doorknobs or mailboxes of the houses along the way. We hope to educate residents that nothing but water should go down the storm drains (no plastic bags, no leaves, no grass clippings, no pet waste, no charcoals from the BBQ grill). Everything that washes into these storm drains finds its way into our Little Noonday Creek and beyond. Meet me in the neighborhood at 9:00am on the 28th. Students should wear tennis shoes, not rubber boots. To get there, take a right out of the church/school and head north on Canton Road. Take the first right onto Ebenezer Road. Cross the railroad tracks. Take the next right onto Bellair Drive. Turn left onto Debonair Drive. We will meet in that culdysac. We will be marking storm drains from 9:00am to 11:30am. We ask that parents stay for that time. If you have a conflict that day, you may arrange with another HomeSchool parent to transport your child both ways. We will arrive back to the school by 12:00pm in time for recess and lunch. Ki Kate will be with the students on March 21st. I'm going to Mobile for my niece's wedding. Quote from a child: "If I was a turtle, I would not want to be a tiny turtle. The crows would be looking at me with dinner on their mind." Quote from Unknown: "If your ship does't come in, swim out to meet it." See you amongst the daffodils! On Tuesday, we learned about Mardi Gras and celebrated with Mardi Gras coins from different years and mango chocolate chip bread. We learned about Great Blue Herons and met Perdido, the Great Blue Heron puppet. Ki Sonya told us a story about her encounter with a Great Blue Heron and we worked together to build a heron nest, complete with three huge sky blue eggs. We learned about the Ivory-Billed Woodpecker, which was thought to be extinct before a few were found in the swamps of Louisiana and Arkansas. We drew herons and woodpeckers. We covered the terms extinct, endangered, threatened, and species of special concern. On Thursday, We celebrated Elsu's 12th birthday. Elsu and her friend Gabby made brownies for everyone. Elsu received a rock (blue geode), a feather (from an emu), a shell (shark eye moon snail), and a treasure (a bracelet made from snake vertebrae). 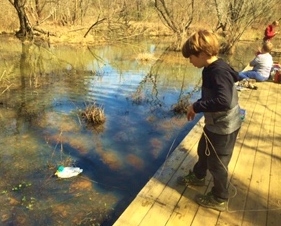 We tied kite string to our painted duck decoys and floated them in the pond to see if we could attract any ducks. We played Hidden Birds, hiding painted Cardinals, Bluebirds, and Goldfinches in the forests for others in the group to find. We discussed camouflage, why female birds are usually mutely colored, and why male birds are so brightly colored. 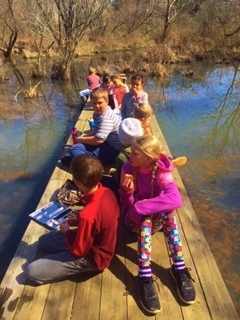 We visited the farm animals and ate our lunches in the sunshine on the beaver marsh pier. Next Tuesday each student will give their bird migration presentation. I'll have a world map and the class globe. They can use either (or both) to trace their bird's migration path. On Thursday, we will learn about the bp oil spill that occurred in the Gulf of Mexico in April 2010. I had the honor of spending 5 weeks after the spill interviewing oil spill workers, shrimpers and fishermen, restaurant managers, and others who were affected by the spill. I collected samples from the water and beaches, took photos, and kayaked to barrier islands to check on nesting birds. We'll experiment to see which substance works best to clean oiled feathers. The Garden Girls Girl Scouts will meet Tuesday the 12th, 3:30-5:00pm at the picnic tables. We will learn how to use maps and compasses. Each girl will receive patches for their participation in the following programs: creek cleanup, stargazing, cast iron cooking, tent pitching, cookie baking, bird feeders, leash decorating, and reading to rescued dogs. I still cannot bend my left thumb, the one I injured when I fell hiking in the snow out west. I'll be going to the hand physical therapist the next three weeks to try to regain flexibility in it. Please add my thumb to your prayers! Quote from a child:"The minute I saw it, I knew you would say that it was special. It was different from all the other things in nature." Quote from Gustav Mahler: "The point is to not take the world's opinion as a guiding star but to go one's way in life, and to work unerringly, neither depressed by failure nor seduced by applause." Hi and welcome to March! HomeSchool had a wonderful week. We began our 5-week study of birds by learning what makes a bird a bird and discovering just how far a bird can migrate. Each student received their bird migration take-home project. We painted actual duck decoys to look like several species of ducks. We hiked to Quiet Corner with Prancer. Ki Erin brought a Russian tortoise and a bearded dragon for us to see and learn about in Creature Feature. We continued to practice with the other Grades students our movements and timing for the Maypole Dance. We'll be performing this Friday, May 3rd. 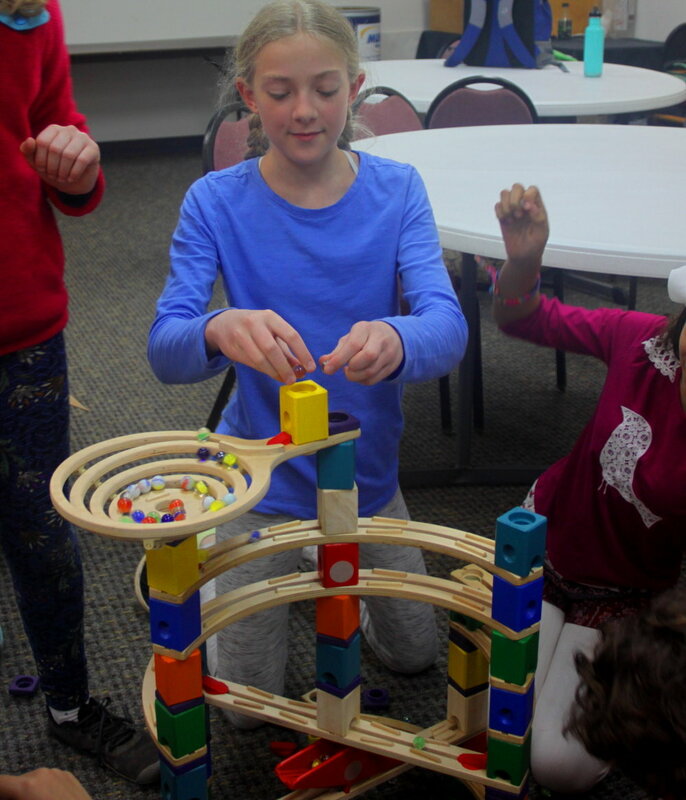 The older HomeSchool students worked with Upper Grades to build marble mountains as a team building activity. Next week we will celebrate Mardi Gras on Tuesday and Elsu's 12th birthday on Thursday! Elsu is baking brownies to share with everyone. We will take our newly painted ducks outside to see how they look floating on the pond. We will learn about Great Blue Herons, how they catch their fish and how they build their nests. We will paint a rain barrel to sell in the silent auction at the spring fundraiser next Saturday, March 9th. Each student has received the name of a champion bird migrator and 3 sheets of masterbook paper. Here are instructions for your bird migration take-home project. 1st piece of paper: draw and color your bird (may use crayons, colored pencils, watercolor, acrylics, or colored chalk). 2nd piece of paper: write a few fun facts about your bird (it's size, it's coloration, what it eats, how it catches it's food, wing span, how many miles it migrates each year, it's summer/winter migration path, if it is endangered or a species of special concern). 3rd piece of paper: draw a map of the area it travels and color your bird's migratory path on the map). 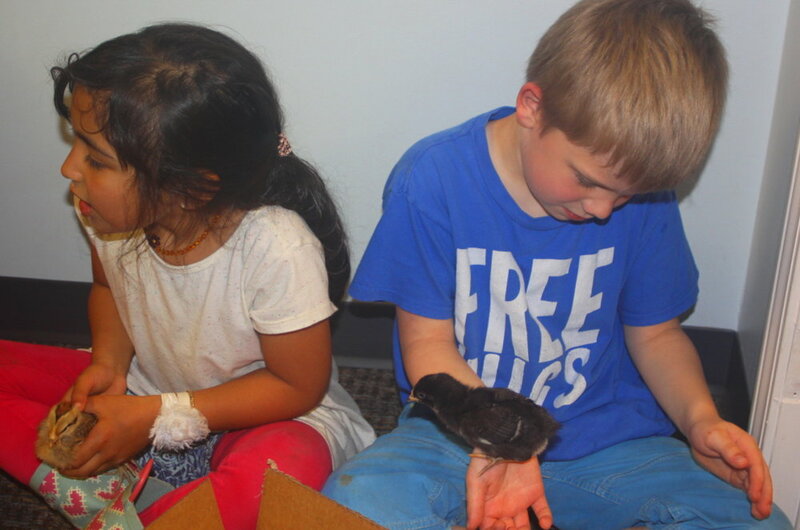 On Tuesday, March 12th, we will present our birds to the class. Each student will be expected to trace their bird's migration path on the class globe. Be sure to bring with you each week: tennis shoes, rain boots, thick socks for the rain boots, extra socks, and pants to change into after our wet and muddy outings. Quote from a child: "After I touched the bearded dragon, all the fear I felt just went away. Look at me. I'm not afraid!" Quote from Maryann Coalmano Love: "I am your parent, you are my child. I am your quiet place, you are my wild." This was our last week of underwater exploration. We drew sharks and shark jaws, and each student took home a shark jaw to keep. We soaked up some facts about sponges! We also hiked with Prancer, read the book Zen Shorts, and helped set up the sanctuary for the Gilgamesh play. Our class loved attending the play and we were delighted to see Brolin and Elsu do so well in their roles. We had a get-together on Thursday to celebrate Valentine's Day and my 60th birthday and to wish Ari best of luck on his new adventures! Thanks to each of you for the beautiful Valentine's cards and generous birthday gifts. Larry and I have packed our snow boots and are looking forward to our trip to the Southwest. As we turn the corner into a new season, we will begin to study one of the most amazing classes of animals: birds. 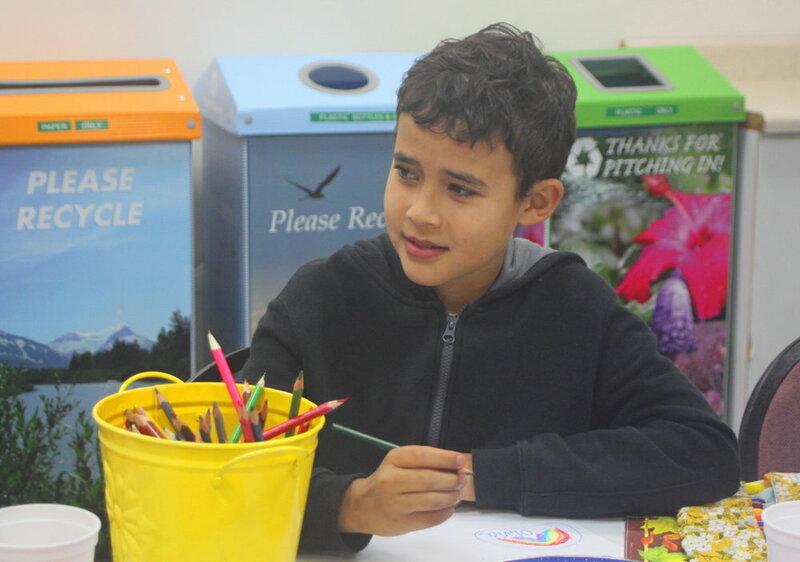 When we return from the break, each student will receive their take-home project on bird migration. I'll give each one a different bird and 3 sheets of masterbook paper. They'll have 2 weeks to complete the project and prepare for their presentation on March 12th. Throughout our 5-week study, I am going to highlight some other special birds, including Great Blue Herons, ducks, sandhill cranes and whooping cranes, owls, ospreys, and seagulls. The next Girl Scout program will be a two-part community service project. We will meet on Tuesday, February 26th at Mostly Mutts Animal Rescue, 3238 Cherokee Street near downtown Kennesaw. Meet us there at 6:30pm. We will paint leashes and collars for adopted dogs to wear to their new forever homes. Then we will meet the dogs, cats, and staff at Mostly Mutts. Girl Scouts who are 2nd grade and older can meet us again at Mostly Mutts the next night, Wednesday, February 27th at 6:30pm. 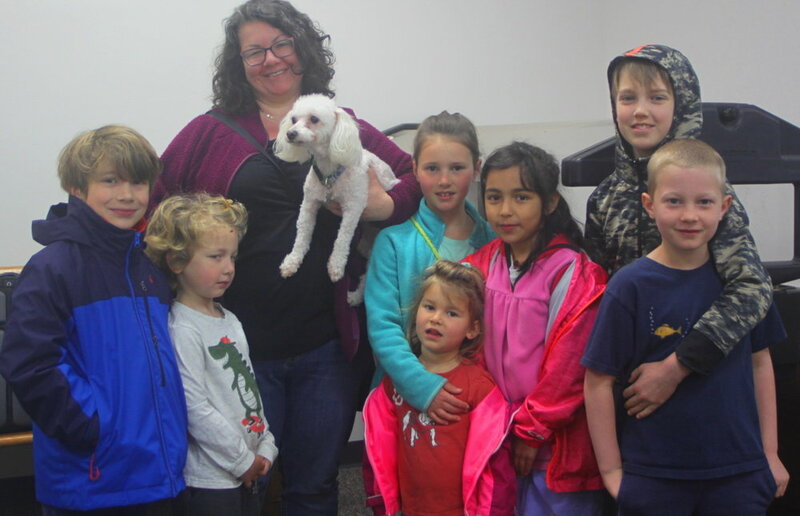 The Girl Scouts will have an opportunity to read to the dogs in the kennels. Bring your own book to read and a towel to sit on. Due to space constraints and liability, parents and siblings will not be allowed in the kennel area (just the scout leaders). We will have a school-wide shelter in place drill and a reptilian Creature Feature on Thursday, February 28th. Quote from a child: "I better go to bed early tonight. I have a dream locked up in my heart that I need to let out." Quote from Anne of Green Gables: "Dear old world, you are very lovely and I am glad to be alive in you." Hope you had a refreshing weekend! Our past week was a fishy one! We created imaginary fish with sidewalk chalk on the back patio. 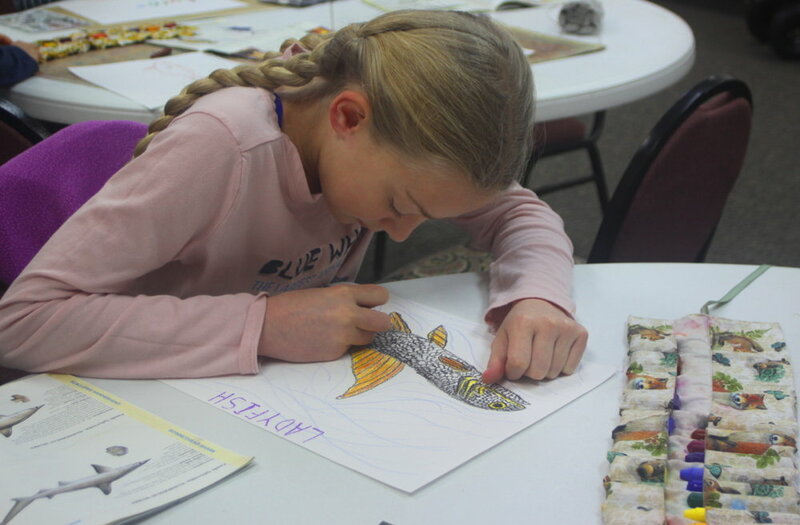 We painted beautiful underwater scenes of schools of fish with watercolor. We talked about saltwater fish and freshwater fish and all the places where fish live. Ki Melanie from Atlanta Audubon Society brought two rescued ruby-throated hummingbirds for us to see in Creature Feature. We learned how we can all protect hummingbirds by planting native plants that are hummer favorites and keeping our cats indoors (or putting bells on their collars). Ollie took us on a student-led hike and we spent a lovely morning playing in the creek. We sang the high-energy song "Alive, Alert, Awake, Enthusiastic". We practiced the maypole dance and song that all grades students will be performing on May 3rd. This is a Friday, but we would love for the HomeSchool students to be a part of that day's celebrations. It is Grand Friends Day, a special day when we encourage students to bring their grandparents and other family members for a formal tea and the maypole dance. This week is Shark Week! We will explore the undersea world of sharks and why they need all those teeth. Both Tuesday and Thursday are half days. Students will be on the playground 12:00 to 12:30pm for pickup. They will need a morning snack but not a lunch. We will go to the creek Thursday morning. Bring rubber boots and shorts that day. I'm looking forward to our parent/teacher meetings in the afternoons. This is a great time to ask any questions you may have and discuss classroom policies and discipline, content of the remaining sessions, and upcoming events. Quote from a child: "I don't know where my boots are. Maybe they walked away." Quote (on a small, hand-painted sign) from Buck, proprietor of a roadside boiled peanut stand, Hatchechubbee, Alabama: "Turn off the phone 'n games. Don't set there getting old, fat, 'n ugly. Go outside and do something." Well, we had a snow day on Tuesday with no snow. We did have some black ice in Kennesaw Tuesday evening so it was a bit sketchy driving around just after sunset. 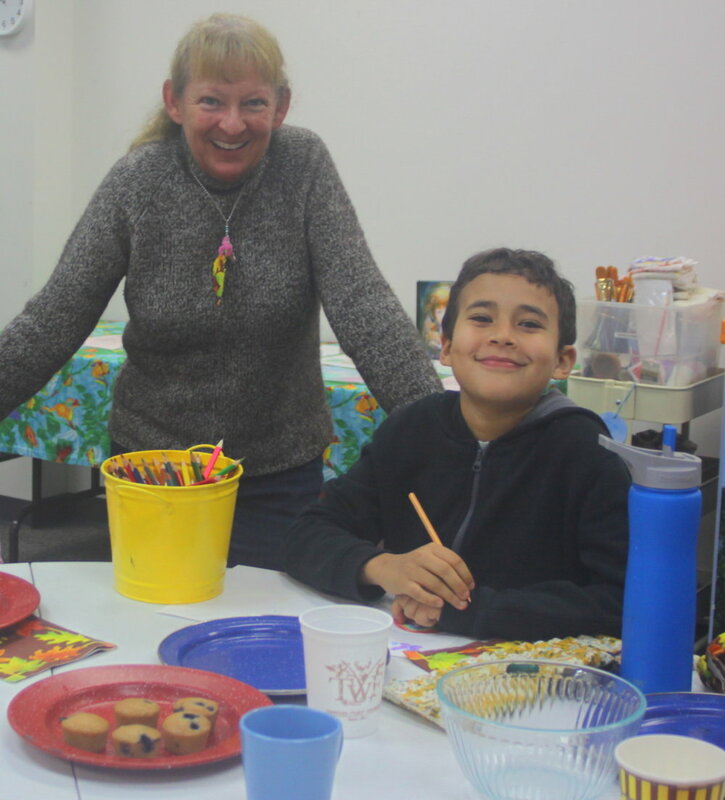 On Thursday, we celebrated Helene’s 8th birthday with lemon cream tarts and hot chocolate and singing and horsing around! 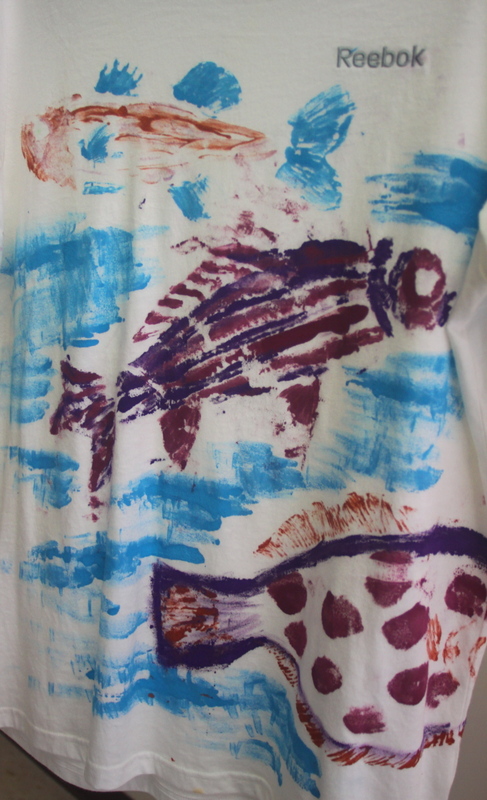 We thoroughly enjoyed gyotaku (fish printing) with fabric paints on our white t-shirts. Thank you to Ki Heather and Ki Jill for all of your help that day! Remember that we have our mandatory parents meeting in the sanctuary this Tuesday evening at 7:00pm. Each family must be represented. Be sure to sign up for a parent/teacher conference with me one afternoon next week. Go to Signup Genius if you haven’t already. At this conference, I’ll show you your child’s class work and art, discuss any discipline concerns, and share details about upcoming events. Quote from a child: "No matter what the teacher says, February is the longest month." Quote from Unknown: "Remember that everyone you meet is afraid of something, loves something, and has lost something." We enjoyed the past week but missed our students who could not be there. We hiked on the new trails. We sang the Boondocks song about fishing in the crawfish hole and a seasonal Hanukkah song about the menorah. 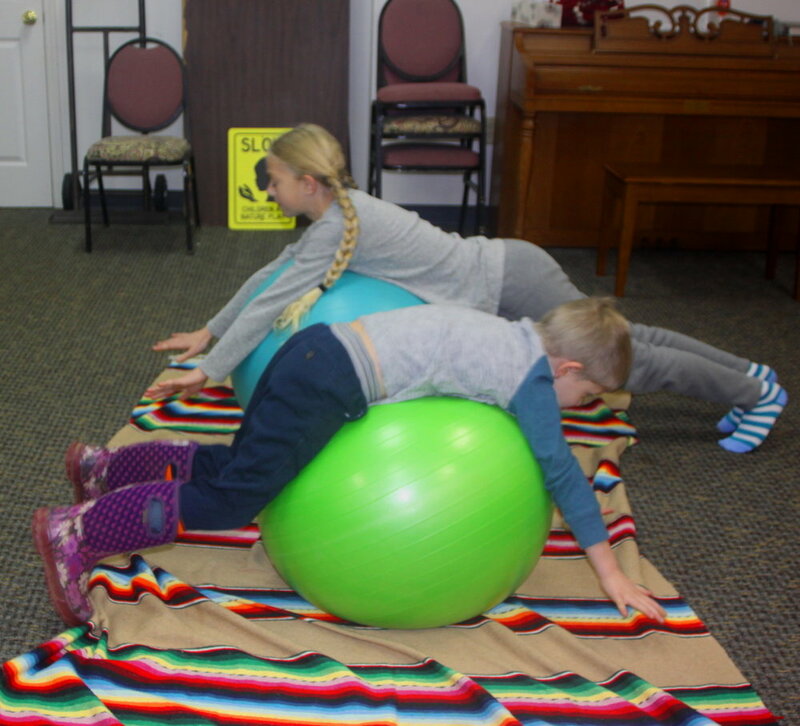 We did stretching exercises on the exercise balls. 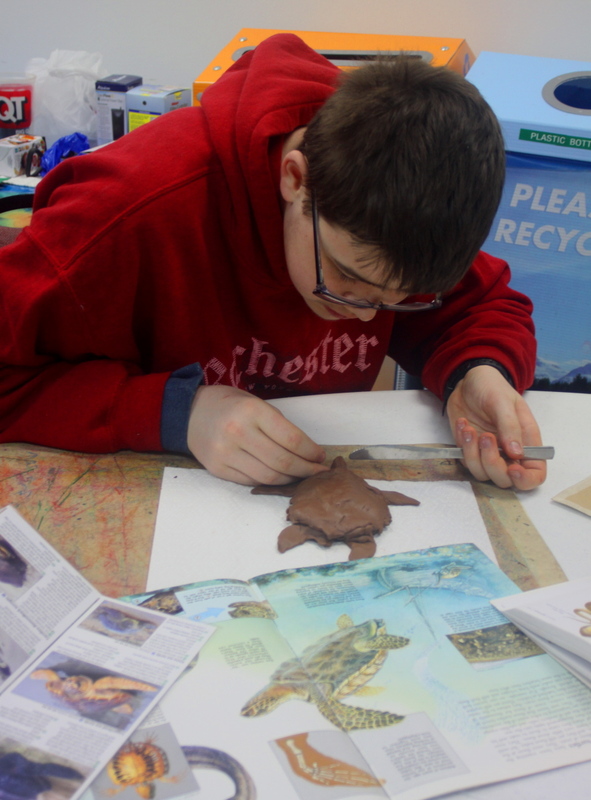 We learned more about reptiles and created some of our own out of modeling clay. We practiced walking with a lite candle in a base made from an apple. 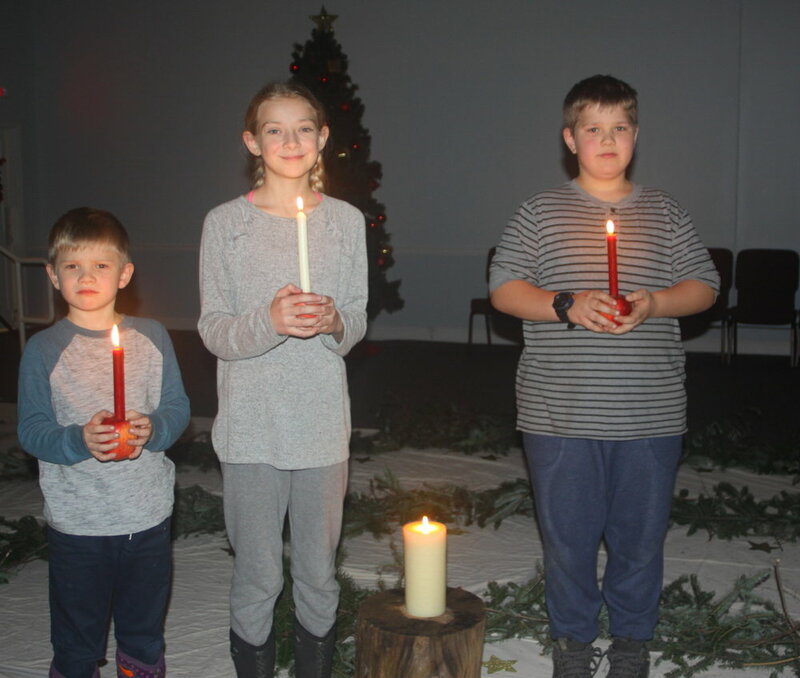 We helped Ki Jasmine set up the sanctuary for the Advent Spiral and then participated in this beautiful ceremony with the other grades students. I was so impressed with the students in how quiet and respectful they all were. 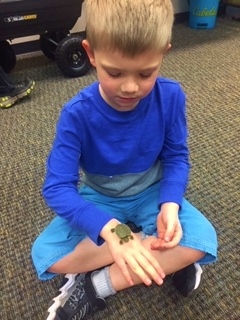 We cared for our new school turtle, a male yellow-bellied slider, in the Blue Sky Room this week. If you would like to take the turtle home for a weekend this winter, let me know. I've attached below a list of tips of how to pack him up and set him up at your house. We will celebrate Lucan's 7th birthday on January 15th, our first day back at school. Caitlyn: Please email or facebook the other HomeSchool parents to let them know what birthday treat you will be bringing that day! We will also give our reptile presentations on January 15th. We will get 4 sheets of master book paper to you by next Sunday the 23rd so you can work on this take-home project. Please use this paper horizontally and front-side only. Each student may choose a reptile to research. On the first sheet, write the name of the reptile, as well as a physical description of the animal (size, length, color, eyes, teeth, tail, feet, etc.) On the second sheet, draw or paint the reptile using crayons, colored pencils, watercolor, or acrylics. On the third sheet, draw or paint a dinosaur or other prehistoric animal that your reptile may have come from/descended from. Use crayons, colored pencils, watercolors, or acrylics. The fourth sheet is for mess-ups or to add additional info. (Some students are going to draw bones or muscles of their reptile on their fourth sheet.) Put your name on the back of each sheet. Don't forget to bring your competed master book sheets back with you on the 15th! The next Garden Girls Girl Scouts meeting will be Tuesday, January 15th, 3:30-5:00pm. We will be in the Blue Sky Room, baking cookies to take to fire and police stations and making pinecone bird feeders to hang around the school campus. We are excited to have Christopher's Dad bring in the train layouts on Thursday, January 17th. The HomeSchool students will mentor and shepard the two kindergarten classes as they come through the Blue Sky Room to see the trains that morning. 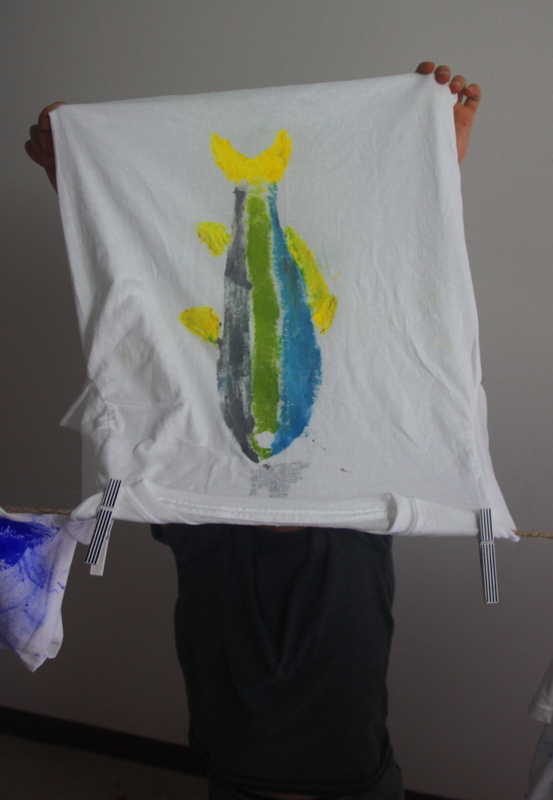 In the next season, we will be studying fish and other marine creatures. We will do the long-awaited activity with the white t-shirts that you brought to school. 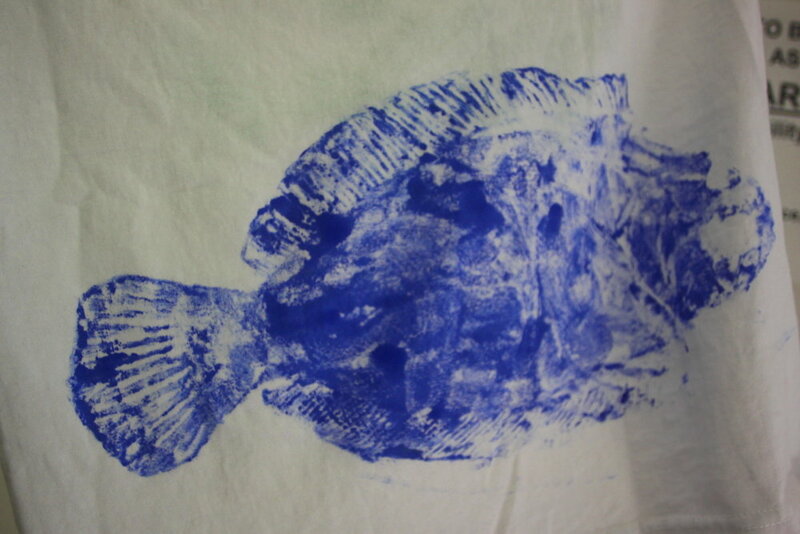 We will do gyotaku, the traditional Japanese method of fish printing, on Tuesday, January 22nd. Kate: Please bring a plain white t-shirt in Mike's size when you come back on the 15th. You can find inexpensive white shirts on the back wall of Hobby Lobby. Quote from a child: "Never walk on ice with your hands in your pockets." Quote from Unknown: "Every so often, invite the person in line behind you to go ahead of you." Fun times at The Garden School! On Tuesday, we celebrated Ari's 14th birthday and had final amphibian presentations by Ari, Elsu, Bear, Lucan, and Ki Sonya. We studied Amphibians vs Reptiles, the similarities and the differences. We went on a student-led hike led by Christopher, who took us to Kindy Beach, Quiet Corner, and to visit the farm animals. And we played Toe Dominoes (see photos)! 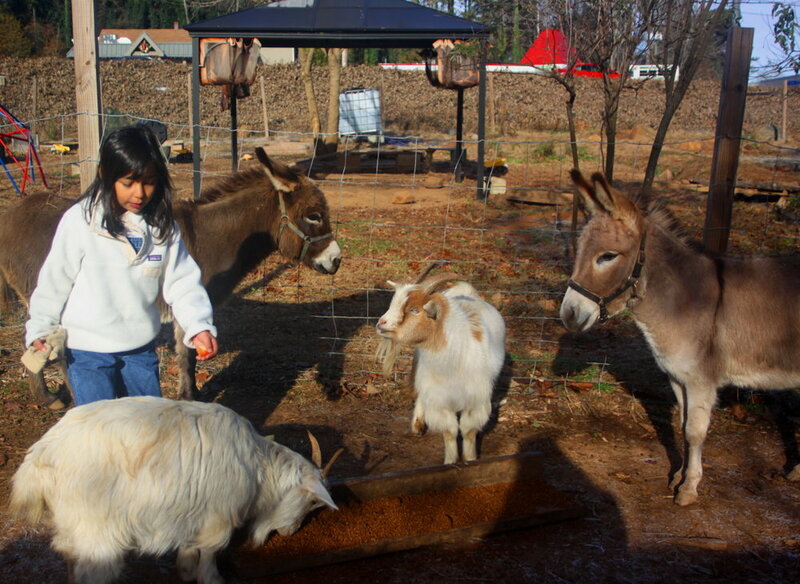 On Thursday, we cut up apples and took them with us when Helene led us on a student-led hike through the playground to feed the donkeys and goats and climb on rocks. The Helene led us to the marsh pier to play with the 1-inch-thick ice that had formed on the surface. This was so much fun nobody wanted to leave! Back inside, we learned about sea turtles and why they are truly world citizens. We got to see an actual baby sea turtle and egg, and we drew sea turtle adults and hatchlings. This Tuesday, Ollie will be guiding us on our student-led hike. We will play the Project WILD field game called Turtle Hurdles, highlighting the predators and risks that sea turtle hatchlings have to avoid to survive. You will need warm clothes and tennis shoes or hiking boots. This Thursday will be an inside day. Wear a nice outfit as we will have our class photos taken that morning. Christopher's Dad, Ki Richard, will set up several train layouts in the Blue Sky Room. HomeSchool students will get to see the trains and ask questions about the mechanics and stories behind them. We will also serve as mentors for the kindergarten students as they visit the train layouts. We will practice walking with a candle so that each student is comfortable with this. 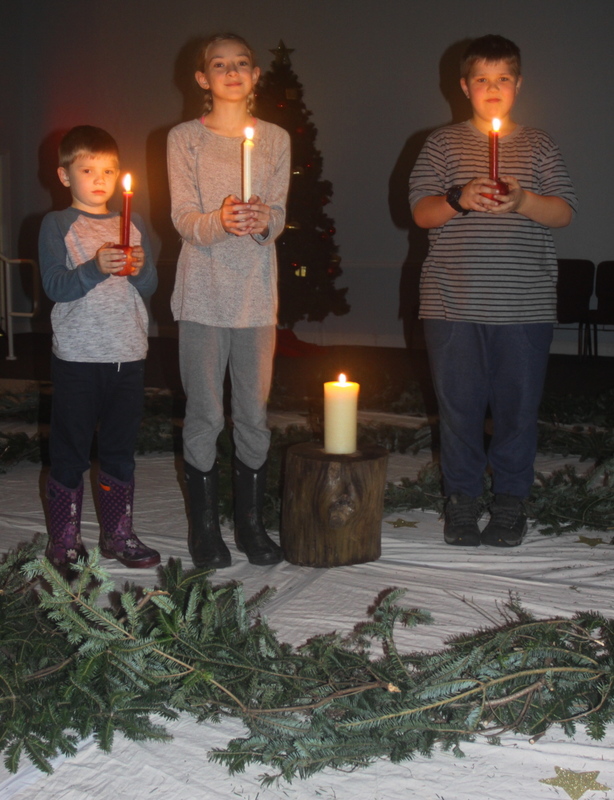 In the afternoon, we will participate with our grade levels in the Advent Spiral, held in the church sanctuary. Please make sure your child's hair is pulled back on this day (or I can help put it into a ponytail holder at lunchtime). On Tuesday, each student will bring home four more sheets of white masterbook paper, signaling the next take-home project. Please use this paper horizontally and front-side only. Each student will choose a reptile to research. On the first sheet, write the name of the reptile, as well as a physical description of the animal (size, length, color, eyes, teeth, tail, feet, etc.) On the second sheet, draw or paint the reptile using crayons, colored pencils, watercolor, or acrylics. On the third sheet, draw or paint a dinosaur or other prehistoric animal that your reptile may have come from/descended from. Use crayons, colored pencils, watercolors, or acrylics. The fourth sheet is for mess-ups or to add additional info. Put your name on the back of each sheet. We will be presenting these on our first day back, January 15th, so don't forget to bring your competed masterbook sheets back then! Always have one or two extra pairs of socks in your backpack. One can never have too many warm, dry socks at this time of year! Quote from a child: "I've learned the best time to ask your Dad if you can do something is when he's sleeping." Quote from Unknown: "Never wash a car, mow a yard, or select a Christmas tree after dark." It is great to be back at The Garden School and I want to thank Ki Kate for subbing for me last week. We have an exciting day planned tomorrow with Ari's birthday celebration and the DeWillers amphibian presentations. 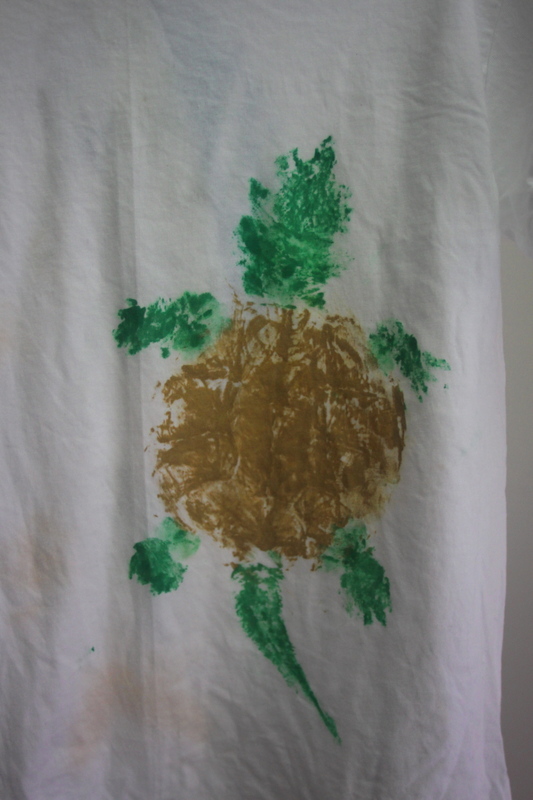 Our activities on Thursday, inside and outside, are all focused on one of my favorites subjects: sea turtles. You don't need boots, just some good tennis shoes or running shoes and a jacket. I want to remind you to join me at the annual open house of The Amphibian Foundation. It will be this Friday from 6:00 to 10:00pm, but come anytime you'd like and for as long as you'd like. There is no charge. We'll be at Blue Heron Nature Preserve, 4055 Roswell Road NE, Atlanta. Highlights include the Ribbit Exhibit of amphibian art and photos, a backstage tour to see where the flatwoods salamanders are raised, food and drink, and the opportunity to hold a frog, a toad, a salamander, a turtle, and a snake. Bring your whole family! Quote from a child: "Make sure there's toilet paper before you sit down." "People sometimes ask me what I worry about most. Climate change? Species loss? Habitat destruction? I worry about all those issues. But what I worry about most is running out of planet." We learned about animal timekeepers this week, and talked about which ones are nocturnal, diurnal, and crepuscular. We discussed which animals sleep a lot in a 24-hour period and which ones sleep very little. As you study different animals, this is a good question to ask about each. We drew fairies, read poems about fairies, and then sketched plans of how we would build houses for fairies. Finally the time came to create a fairy village at the edge of the woods, complete with fairy houses, bridges, tunnels, pools, a beach, a theater, and tiny lights to welcome them. Before we were finished with the village, a cold, fine mist moved in. It dampened us but not our spirits! We had a going away get-together for Logan whose last day was Thursday. Logan and her parents, Mike and Kelly, are moving back to southern California to complete the movie Mike is directing. A BIG thankyou to Ki Kelly, Ki Julia, and Ki Debbie for preparing a special snack and hot beverage for us all! Thank you too for the beautiful fall centerpiece. We will begin our reptile study the week of November 28th. Ki Kate will be subbing for me and she'll talk about snakes. When I return on December 4th, we'll finally get to celebrate Ari's 14th birthday at school. This will also be the day for Ari, Elsu, Bear, and Lucan to give their amphibian presentations, and I'll give my presentation on hellbenders. Thursday, December 6th we will be focusing on sea turtles. The next Garden Girls Girl Scout program will be Tuesday, December 4th, 3:30-5:00pm at the school. We will learn how to pitch a tent and the kinds of gear you need for a camping trip. We'll go fishing in the crawfish hole. Till the sun comes up in the morning. Quote from a child: "If the horse you're drawing looks more like a dog, make it a dog." Quote from Sir Laurens Van Der Post: "Convoys, boating trips, and hiking expeditions are best led from behind, where trouble, like the dust, invariably settles." I am so thankful for all of our HomeSchool families during this, my favorite holiday. Have a wonderful Thanksgiving! 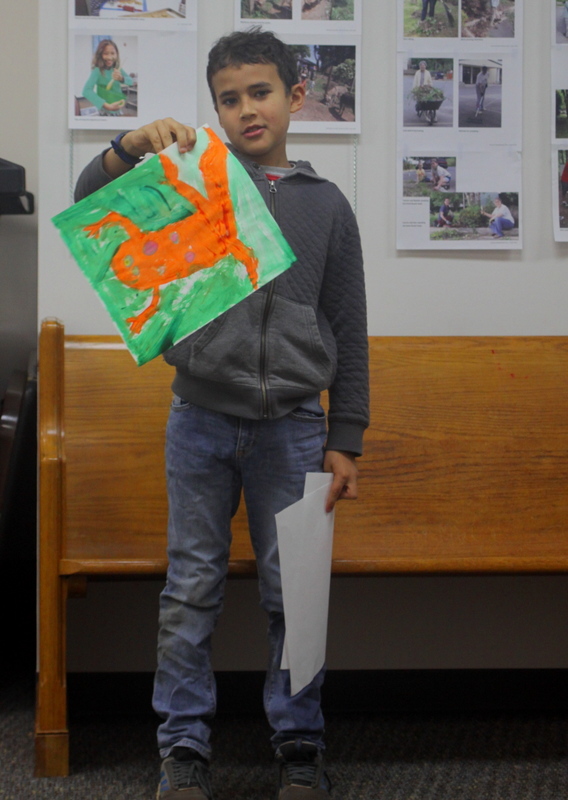 HomeSchool students gave their Amphibian presentations Tuesday morning. I was very impressed by their public speaking skills with each one standing, making excellent eye contact with their audience, and speaking clearly. Great job! Thursday dawned cloudy and cold for our Lantern Walk but we had a good time walking the trails with our handmade lanterns and singing the lantern songs. 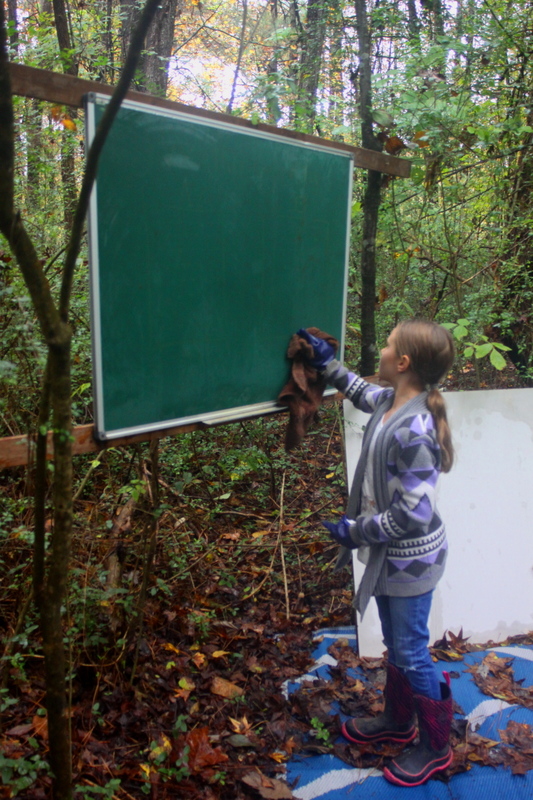 We worked hard on Privet Pocket, our outdoor classroom, cleaning, sweeping, and clearing vines and limb from HomeSchool Trail. 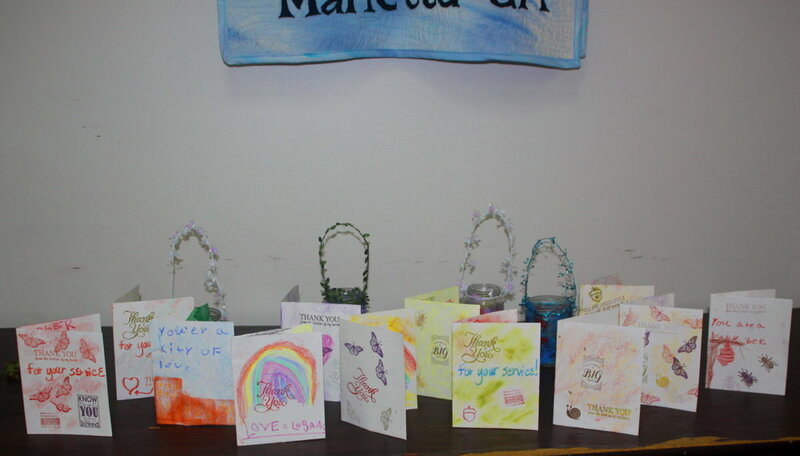 We wrote and colored thank you notes to Atlanta-area veterans. Ki Jasmine delivered these for us. 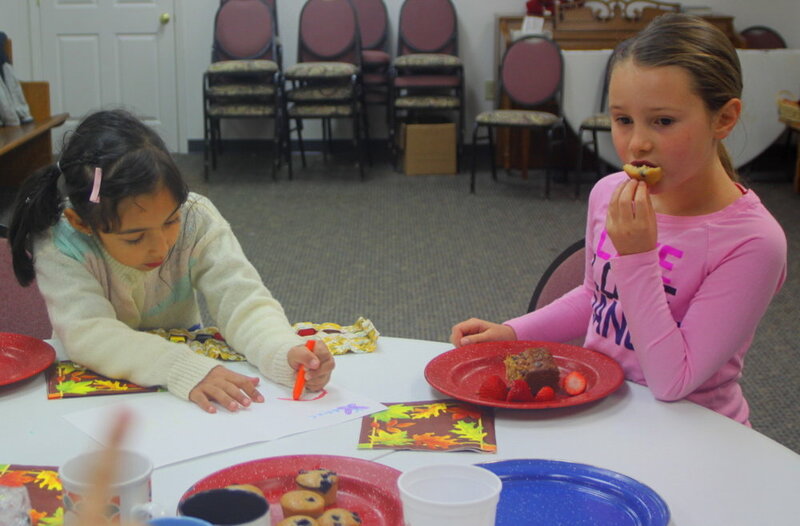 We painted wooden maple leaves and real hickory nuts to add to the centerpiece decorations for Thanksgiving dinner November 16th. 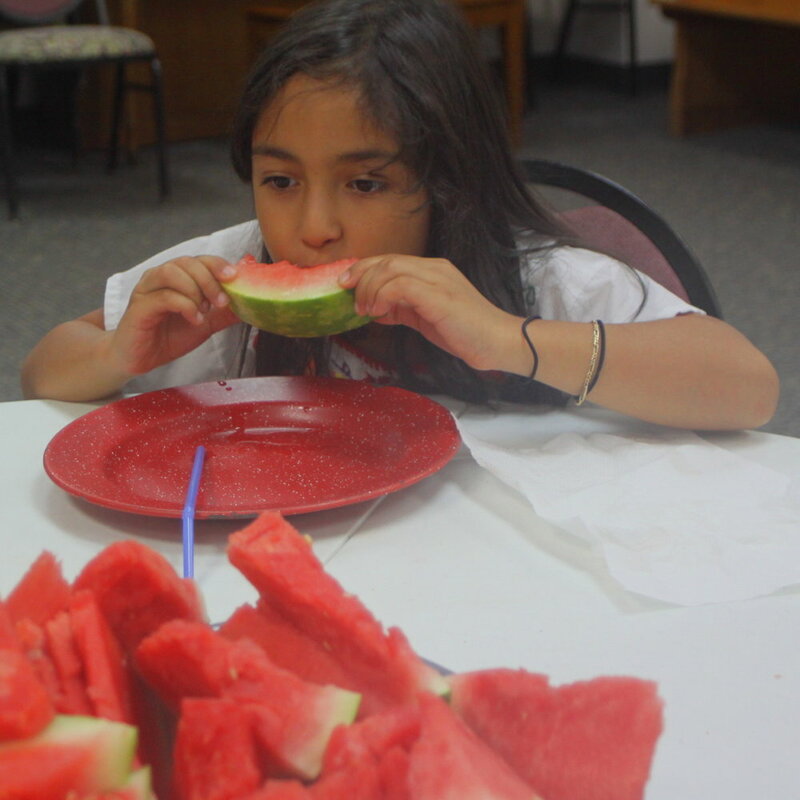 This potluck begins at 11:30pm on Friday, and HomeSchool families are welcome to participate. It is a Three Sisters dinner. Bring a corn dish, a bean dish, or a squash dish to share. On Tuesday we will learn about animals as timekeepers. We'll talk about Aldo Leopold's Dawn Bird Chorus and generate a list of animals that are nocturnal, diurnal, and crepuscular. We will talk about fairies (mostly nocturnal) and collect materials from the forest for fairy houses building. On Thursday we will build fairy houses outside and, if it gets too wet and cold, we'll play Nature Bingo inside. Bring raincoats or jackets, rain pants, extra socks, and rain boots for both days! Logan's last day with us is Thursday. Ki Kelly will bring a special snack and hot beverage for her going-away get-together that day. Their family is moving back to southern California, and not a minute too soon if they want to avoid the cold weather. Thanksgiving Break is Monday, November 19th through Friday, November 23rd. Ki Kate Brown will be subbing for me the following week, November 27th and 29th, while Larry and I are on the family cruise with my Dad. That will be the first week of our study of reptiles! Quote from a child: "Toads aren't ugly. They're just toads." Quote from William Morris, English writer, artist, & designer, 1834-1896: "Have nothing in your house that you do not know to be useful or believe to be beautiful." Whew! This had been some week, with a lot of fun and excitement. 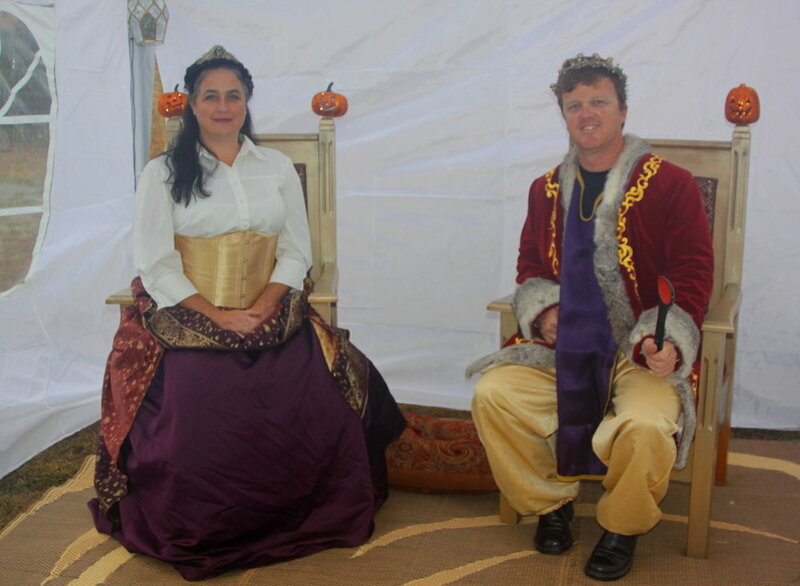 The Kingdom of Halloween Festival was a great success and a good time was had by all. On Tuesday we created our lanterns for the Lantern Walk, got to see some live newts from a Cobb County park, put our troubles and cares into the Worry Frog, and played in the creek and on hay bales. Several students showed the class their leaf and rock collections. Brolin and Nellie (from Upper Grades) helped me test the temperature, pH, and dissolved oxygen level at Kindy Beach on Little Noonday Creek. Our Sapphires will be testing the creek once a month, partly to see how it's doing and partly to learn about water quality monitoring. Thursday we gathered leaves to use in our leaf rubbings. Along the way, we found a new trail to try to improve. It leads to the area where the miller's daughter did her spinning during the Halloween Festival so we named the trail the Miller's Daughter's Trail. We used crayons for our leaf rubbings. 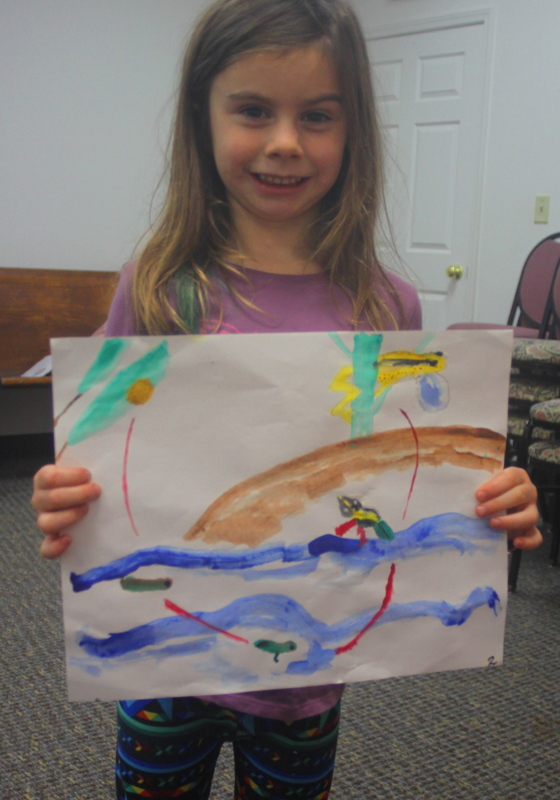 We talked about newts and salamanders and created lovely watercolors of salamanders using blue, red, and yellow. Next Tuesday we will give our Amphibian presentations! Please bring your four sheets of masterbook paper, ready to turn in. I can't wait to hear each presentation and learn more about the world's amazing amphibians. It looks like rain that day, but bring water clothes and water shoes just in case we get to go to the creek. Also on Tuesday, the Garden Girls Girl Scouts will be doing some cast iron cooking. We'll prepare a meal in Dutch ovens and taste our creations. Girl Scouts should wear closed-toes shoes (not rubber boots) and warm clothes. Next Thursday, for Veterans Day, we will do our Lantern Walk along the trails to Privet Pocket in the morning. We'll paint wooden leaves and hickory nuts for centerpieces. And we will write and draw cards for patients at the veterans hospital here in Atlanta. Quote from a child: "We found a turtle in our yard and my Mom put it in a box so it was a box turtle." Quote from Unknown: "Make the rest of your life the best of your life!" We enjoyed the past few days and got to spend some precious moments in Little Noonday Creek before the cold weather sets in. We worked in teams to build straw boats (boats made of drinking straws) and floated them down the creek. 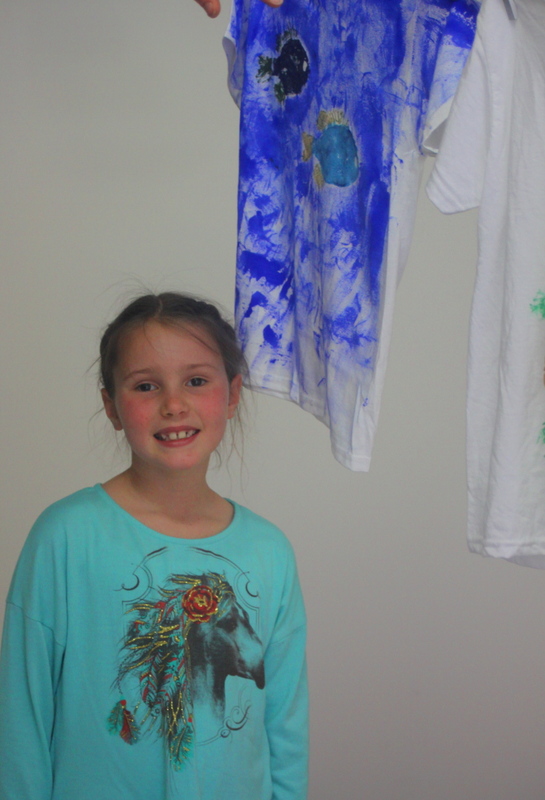 We created watercolor landscapes in blue and green. We looked at the the biggest shelf fungus in Cobb County. 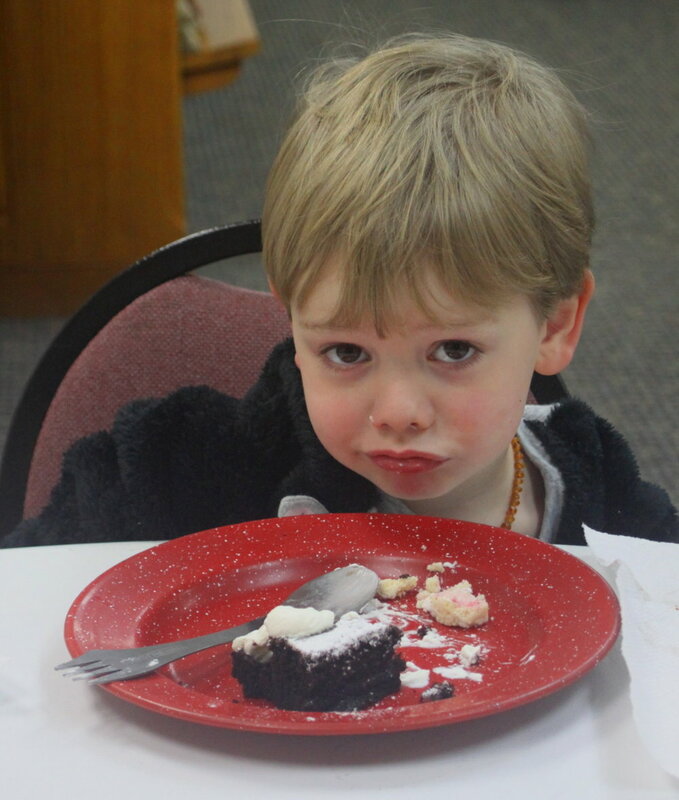 It was delightful to have Brolin's Mom, grandparents, and great aunt with us for his 10th birthday celebration. I've attached some photos below. Please bring any rock or leaf collections that you would like to share this Tuesday. 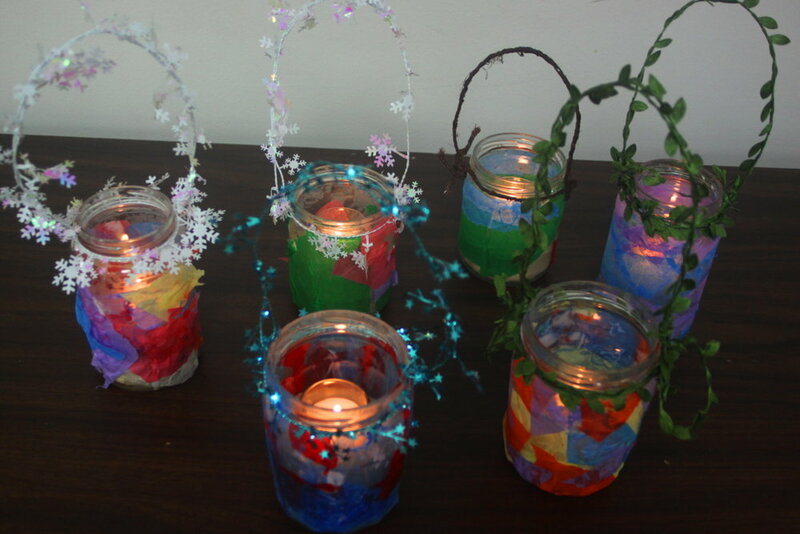 We will also start work on our lanterns Tuesday, gluing tissue paper to the jars. Due to parking and after-dark safety concerns, the evening Lantern Walk will not take place this year. Our HomeSchool group is going to walk the trails with our lanterns during the school day and we will write and draw cards to patients at the Veterans Hospital here in Atlanta. We are beginning our study of newts and salamanders this week, and will have some animal ambassadors from Sweat Mountain Park. Please continue to work on your Take-Home Amphibian projects so that you are not rushed at the end. These are due Tuesday, November 6th. Be sure to practice your presentations at home at least once. Bring rubber boots, rain jackets, warm jackets, and extra socks this week so we can spend some time outside on the trails. Write your name on everything! I am extending an invitation to all HomeSchool families to join me at the Amphibian Foundation's annual Open House and Ribbet Exhibit (amphibian-based fine art). I was able to attend last year and it was a blast! It will be held Friday, December 7th, 6:00-10:00pm at the Blue Heron Nature Preserve, 4055 Roswell Road NE, Atlanta. You will definitely get to hold a frog, a toad, and a snake. The fun will include live animal demos, behind-the-scenes tours, food and drink, and a gift sale. Come and go as you like. This event is free. The nonprofit Amphibian Foundation is not generally open to the public. Mark and Crystal Mandica, founders of the Amphibian Foundation, are amazing! Check out their website at amphibianfoundation.org. I have three more sessions of occupational therapy for my left wrist and hand and I will be as good as new (on that side)! I will be away from school November 27th and 29th for our family cruise (with Kate Brown substituting) and December 20th for my right wrist surgery (with Kate Brown substituting). Quote from a child to his Dad: "Let's play darts. I'll throw and you say "Wonderful!"" Quote from Unknown: "Fall asleep with a dream. Wake up with a purpose." I've attached photos below from our wonderful week. This Tuesday there is a Simplicity Parenting discussion in the parent lounge at 2:00pm if any of you would like to attend. I hope to be there too. On Tuesday the HomeSchool group will be singing our two lantern songs, Glimmer, Lantern, Glimmer and L'Bimba, L'Bamba, L'Boom, as well as All Through The Day, Let Us Sing Together, and Iko, Iko. We will celebrate Brolin's 10th birthday with special cupcakes at the Pond Overlook. 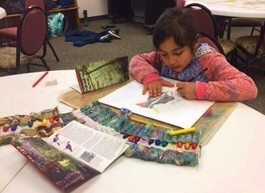 We will be painting watercolor landscapes with blue, green, and red. On Tuesday at 3:30pm, the Garden Girls Girl Scouts will do a Creek Cleanup on Little Noonday Creek so all Girl Scouts should wear old tennis shoes or rubber boots and old clothes that can get dirty and wet. Bring gloves if you have them. Be sure to bring in your wide-mouth glass jars by Thursday so we can make our lanterns the following week. On Thursday, I will be asking each student to talk about how what they did to fill the Let's Go Outside prescription that I gave you during our parent/teacher conferences. Join us if you can for the Kingdom of Halloween Festival this Saturday, 4:30-8:30pm. You are encouraged to wear a costume, as long as it is not scary, does not include a mask, and is not based on any media like movies, video games, or TV shows. I will be there as the official greeter and you may recognize other teachers and parents as you make your way through the kingdom. Please continue to work on your Amphibian take-home projects and be ready to give presentations on them Tuesday, November 6th. Each student received 4 sheets of masterbook paper. These may not be folded. If you find that yours are folded please take home new sheets this Tuesday. The sheets should be used horizontally and front-only. What is the common name and nickname (if any) of your amphibian? How big is your amphibian? What is one cool adaptation that it has? What are the stages of its life cycle? What does it do in winter? Is it common or rare? How is is affected by humans? Your answers and descriptions may continue on the 4th sheet of paper or you may use the 4th sheet as a do-ever sheet. As you practice, be sure to emphasize these public speaking skills: standing, facing your audience, making eye contact, projecting your voice, holding your paper so that everyone in the audience can see it, and, my favorite, exuding enthusiasm for your subject. Quote from a child, written on the chalk board in the Marigold Room: "I don't fill good today. My trout hurts." Quote from Rick Bragg, in My Southern Journey: "People ask all the time, what's wrong with kids today? I have long held that they have been brain-mushed by too much screen time, but as summer races past me now I think it is something else. I think they do not know how sweet it is to feel the mud mush between their toes." Hello and happy fall! We had another week of learning, growing, fun, and adventure! We learned how frogs are viewed by different cultures around the world. 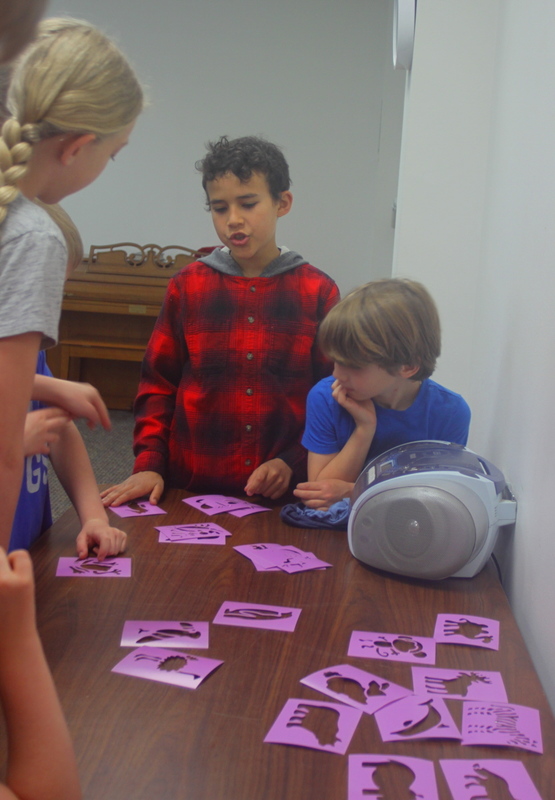 We played a frog card match game, talked about the differences between frogs and toads, put together a rainforest tree frogs floor puzzle, and jumped our best broad jumps in the Frog Leap math activity. We lined up the stages of a frog's life cycle. We read a frog alphabet book and chose the amphibian that each of us is going to research. Logan gave her Great States! presentation on Hawaii as a puppet show complete with big surf, active volcanoes, nenes, and hula dancers! We completed the detail painting on our talking sticks, sprayed them with a matte acrylic sealer to make them weather-proof, and used sinew to add feathers, seeds, and beads. After the heavy rains and rising creeks this week, we hiked to 4 points along Little Noonday to check the water levels. We saw a paper wasp nest from a distance and a yellow jacket nest up close! Our students showed great bravery on Thursday and received Courage Awards from Ki Jasmine. Thank you to Ki Patrick for providing the materials for our talking sticks. 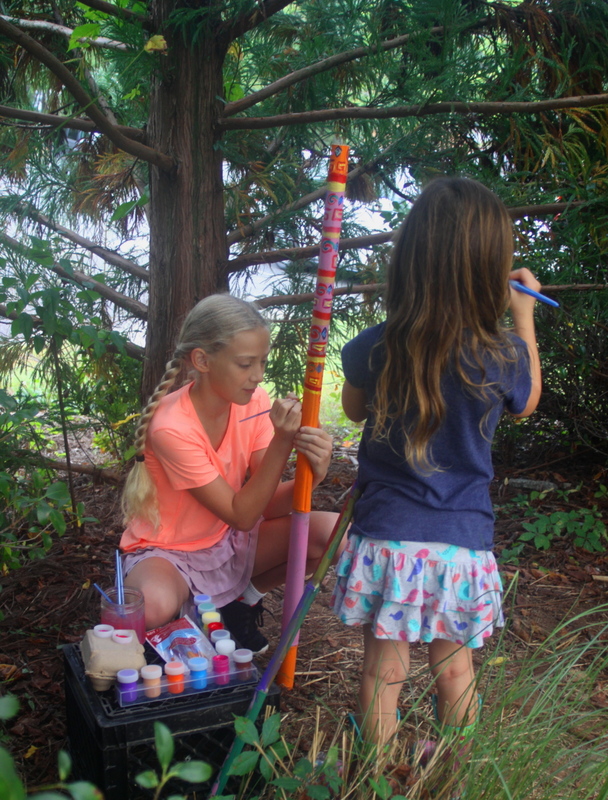 Thank you to Ki Kelly and Ki Julia for helping with the talking sticks project. Thanks to everyone for taking the time to come in for our parent/teacher conferences. Please let me know anytime if you have more questions or suggestions. The Amphibians take-home project is due Tuesday, November 6th and we will do our presentations to the class that morning. In your practice, be sure to emphasize these public speaking skills: standing, facing your audience, making eye contact, projecting your voice, holding your paper so that everyone in the audience can see it, and, my favorite, exuding enthusiasm for your subject. This is one I created last year to sing during transitions. I hope we can sing it as a round someday soon! These are the songs we'll sing along the Lantern Walk on Thursday, November 8th. My lantern goes with me. Down here on earth shine we. We are going to make our own glass lanterns for the Lantern Walk. I have all the supplies we need except the jars. Please bring a wide-mouth glass jar for your child's lantern to the Blue Sky Room by Thursday, October 25th. Medium-sized jars are best, and the colorful tissue paper sticks best to those jars that are not embossed with Ball or other writing on the glass. The first scent was cinnamon, the second one was peppermint, and I'm pretty sure the third one was vanilla abstract!" Quote from Sarah Williams: "I have loved the stars too fondly to be fearful of the night."